Did you know that filmmaking helps to develop higher order thinking skills? Check out Niko Theodosakis’s The Director in the Classroom: How Filmmaking Inspires Learning, and explore how making movies fosters important skills like visioning, research, problem solving, logic, planning and analyzing. With apps like iMovie, making quality films in the classroom is easier than ever. And while a student may pick up some of the nuances of the iMovie app in no time at all, it’s still important to gives students resource and tips so their movies really shine. 1. Provide guided playtime. Whatever app or program you use to make films, it’s important the students receive adequate time and support to learn the app/program. Sure, they can pick up an app like iMovie and just create – but if you are serious about the students producing quality films, then set up a system where students “practice” using the production tool. I call it “guided playtime” – the directions for how I set this up in my classroom can be found here. 2. Have the students create a practice project by mimicking a famous film scene. For the students’ first foray into Hollywood filmmaking, I provide them with 40-60 second clips of Hollywood movies (Madagascar, Wizard of Oz, Monsters, Inc and Finding Nemo). Using toys, plastic figurines and self-built sets, the students must recreate a scene shot-for-shot, angle for angle using the ripped audio from the clip. What does this do? It gets the students thinking like directors. They work together to set-up scenes and are thinking about why directors use different angles and why they choose to cut where they do. First-time student filmmakers sometimes have the tendency to set-up a camera on a tripod and shoot a scene, but this results in boring films with not a lot of imagination. The mimicking projects put students into Hollywood directors’ chairs, and they soon realize that a lot goes into shooting a 60 second film clip. Check out a finished result here, and my rubric for this practice project can be found here. 3. Storyboard, storyboard, storyboard. When it comes time for students to shoot original ideas, force the students to storyboard entire sequences. Every shot, every angle – turn them into mini-Wes Andersons. While the students might complain that they are crappy artists and storyboarding doesn’t help, it does. 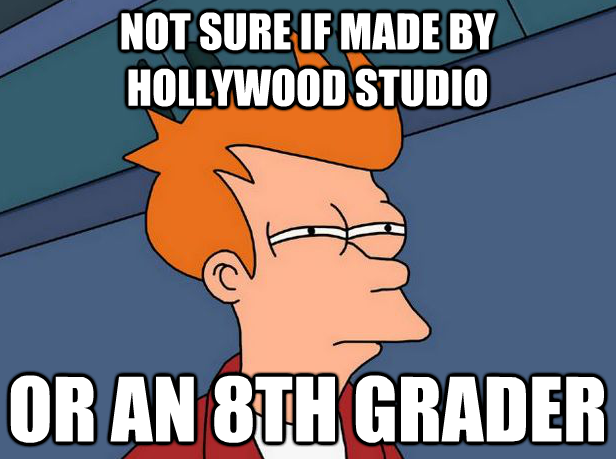 At the very least it gets students thinking about their film, and it will really pay off in the end. Click here for a storyboarding template. 4. Follow the rule of five. Did you know the average length of a cut in Christopher Nolan’s Insomnia is under 2 seconds long? Cue up a standard Hollywood movie scene in your classroom, and have the students clap every time the scene cuts to a different angle. They’ll be shocked at how often they are clapping. Most movies have between 2-5 seconds per cut, on average. So when it came time for my students to edit their mini-documentaries (a 3-5 minute showcase of a local business) they were instructed to have no cut longer than 5 seconds. This forces them to think outside of the box – and then they really start to shine. You’ll see cutting away during interviews (with the person’s voice still going), landscape shots with pulled audio, creative angles – the students will surprise themselves, and the results will be astonishingly slick. Check out this student film for an example (apologies for the low-res). 5. Have your interviewees look off camera. When my students conduct interviews for their mini-documentaries, I instruct them to film their interviewee at a slightly off-angle so they aren’t looking straight into the camera. Have the interviewee look at someone who is not the cameraperson (one student asks the questions, another holds the camera). It helps keep the interviewee more comfortable, and the project looks more professional. 6. Use as many different angles as possible for an interview. When interviewing someone, after you get a few shots, kindly ask the interviewee to move to a different location. Film there, and then move to a different spot. Film the person walking and talking, etc. The movie will be more interesting, active and fluid. Also make sure to film pretty close-up for speaking scenes – no more than five feet away. Most mics on small cameras, phones and iPads aren’t that great. 7. Film weird and crazy angles. This is a bridge from number 6, but demand that the students be creative! Lay on the ground and shoot from a low angle. Get up high and shoot some crazy shot. Most of it winds up on the cutting room floor, but the shots that remains will make the film infinitely more engaging. 8. Footage with no talking is fine. In a final product, students sometimes tend to cram all their footage together without letting it come up for air. I encourage scenes where it just scenery and landscape – let the footage breathe. 9. Film everything! For a 4-minute film, the student might have 20 minutes of footage to pick through. That’s a great thing – and it forces the students to really analyze their film and problem solve how it all comes together. 10. Give the students fun mini-challenges. Show the students this scene right here, or maybe this shot. Challenge them recreate their own versions. It allows them to get their creative juices flowing and think outside the box.